Welcome To The World Of The Sylvanian Families Town Series! 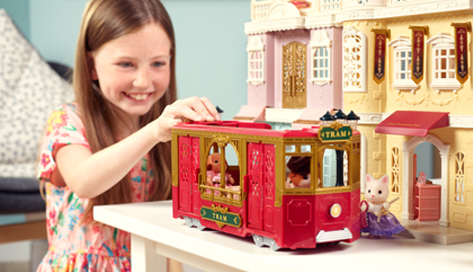 Proudly distributed in New Zealand by Holdson, the exciting world of Sylvanian Families expands to include the Town Series. Featuring a luxurious Grand Department Store, it is the perfect place for special ‘Day Out’ events. Located on the west side of the Sylvanian Village, the Town is where everyone goes to enjoy a day of shopping and fun! Portraying sophistication and style, the beautiful buildings and sparkling cobblestone paths make this an unmissable visit. Like many bustling towns, the tram provides the perfect form of transportation between stylish stores and delicious restaurants. Grand Department Store – the place to go for fashion and beauty! The perfect form of transportation within and around the Sylvanian Town. Elegantly detailed with red and gold, this tram has detachable seats to allow you to create various layouts for your passenger’s comfort. Includes: tram stop, ticketing machine and driver’s hat.